This is your official invitation to participate in the ShmoozaPalooza which will take place at the SnowSports Industries America snow show on Friday, February 1st 2013, in Denver, Colorado. The #Shmooz is a one-of-a-kind gathering and opportunity for employers and prospective employees to connect in-person. It's FREE to everyone!! Free to attend and free to exhibit for companies exhibiting at SIA. Read on to find out what companies will be attending and specific event details. If you're left with questions, enter them in the comment box below and they will be answered. YOU! The amazing people and companies that make up the Snow Sports industry. 11am - 4pm - Career Fair & Networking - come out and connect with great employers. Great employers, come out and connect with great employees. It's an IN-PERSON event! It brings a resume to life! 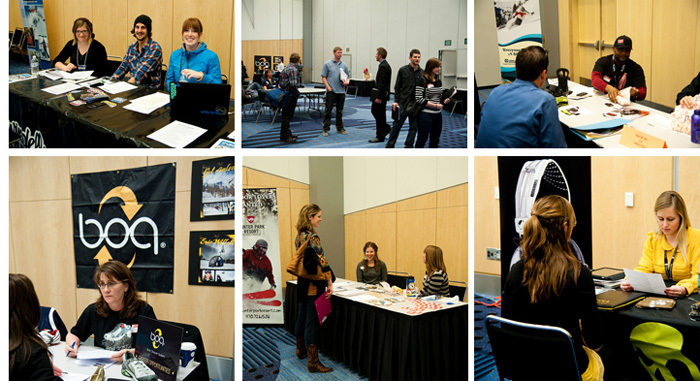 It's the best way to connect with employment opportunities in the snow sports industry! Parking - information on parking rates / location for the convention center. Treat attending this event like you'd be going to a job interview. Bring whatever it is you need to present yourself as a candidate for job opportunities in your profession. Absolutely bring a resume, roughly 20 copies or so. If you're a Designer, bring a portfolio and some sort of sample presentation that can be left behind. Whatever you're comfortable in! If you're curious about what people wear in this industry, check out the Industrial Profiles on Malakye; it's pretty true to how it really is. For you to sit down and relax at while thinking of your next move/who to talk to. For companies to use when they want to talk more in depth with particular people. That said, if you see a conversation going on that looks like a meeting, be respectful and give them some space. IS THE ACTUAL TRADE SHOW OPEN TO THE PUBLIC? No, the tradeshow floor is not open to the public. The Shmooz is reserved for candidates and employers only. But if all goes well for you at the ShmoozaPalooza, you will be in the trade next time! If this information leaves you with unanswered questions, drop us an email.